Overseer Network Monitor uses standard Windows system commands to monitor your critical processes on your mission-critical Windows servers and workstations. Not all critical software runs as a service, sadly, so this allows you to monitor the uptime of any Windows process. Overseer Network Monitoring Software is capable of monitoring Windows processes remotely via standard Windows networking. This allows you to monitor all your critical processes from a single monitoring workstation. Overseer will send you a notification via Email or text message if something goes wrong. Overseer can detect problems based on the process not running, running, too many instances running, too few instances running, not exactly a specific # of instance running, excessive CPU usage, or excessive memory usage. 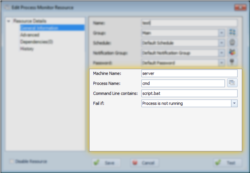 Processes can easily be chosen from a selection box, or typed in manually. Processes can be optionally matched based on the command line, allowing you to match processes such as cmd.exe or powershell.exe that are used for scripts. Overseer can monitor processes running on any computer on your network. It does this without any agents installed on the remote computer, saving you the aggrevation, bother, and time involved in installing these agents. Overseer can match processes based on process name, but it can also match based on the specific command line used to launch the process. This is very useful for processes which are used to run scripts, application pools, etc. Overseer can be configured to send notifications when a process is running, or when it is not running. This can be useful to be notified if a critical program stops running for some reason, or if employees are running programs that should not be running. Overseer can fail based on the # of instances running-- too many, not enough, or not exactly a specific amount. This can be useful if an application has strict requirements on how many processes of a specific type should be running for proper functioning. 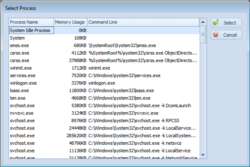 Overseer can fail based on the memory usage of the matched process. This is very useful to watch processes that have memory leaks, or are otherwise ill-behaved. When this option is configured, Overseer can notify you so you can restart the application to avoid problems. Overseer can fail based on the CPU usage of the matched process. This is very useful to watch processes that have a tendency to consume an excessive amount of CPU. When this option is configured, Overseer can notify you so you can terminate and restart the application to avoid problems.